This activity is more about the process than the product (as it should be). 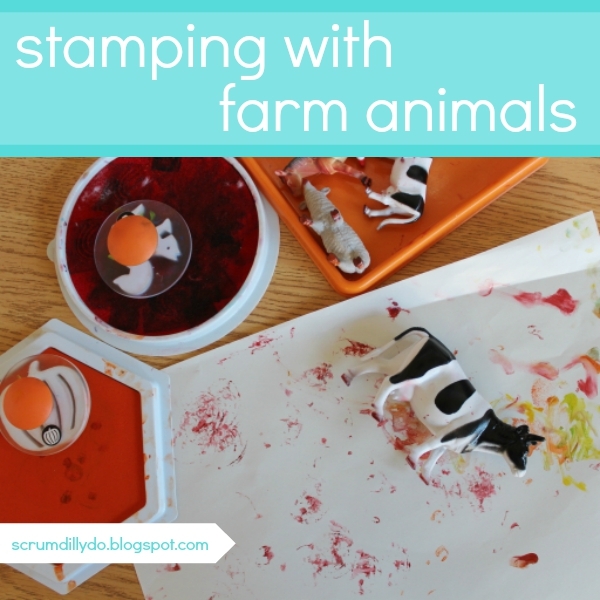 The kiddos in my classroom really enjoyed this activity, spending a lot of time pressing the animal into the stamp pad, examining the color on the feet and then pressing or stampeding across the paper. Cause and effect in action. Here is the invitation to investigate. Set out paper and have extra sheets available for the next kiddo or for your kiddo to create another stamping. We limited the ink pads to Fall colors and had many discussions on the colors, their names, what objects in nature match, how they were warm colors, etc. The kiddos knew exactly what they wanted to do. The other stamps were cleared out in favor of the farm animals. We spent time talking about the different animals, naming them, and making their sounds. Many of the children in the classroom have farm animals at home. Chickens mostly, but one other had a goat and a pig. A lot of conversation surrounded the rooster and chickens. She thought the stand the goose's feet were on was hysterical. We talked about why the goose figure had a stand while the cow did not. She learned new words such as balance, stand, and leverage. Have you ever watched a kiddo make art? There is a lot of dialog, even when there is no one else there. I love the sound effects. Here she began with honking but ended with a silly song she made up. When the rooster came in to play, it was a down and out barn dance! I think this young lady spent all of her discovery time at the table here. Trying out each animal, examining the differences in the prints, mixing ink colors, and learning, learning, learning. Here the cow makes an appearance as he decorates this young person's paper. I was both surprised and not surprised by all that was happening and learned at the stamping table. Don't let the farm animals have all the fun! Try using cars, dinosaurs, reptiles, or insects! Have fun!